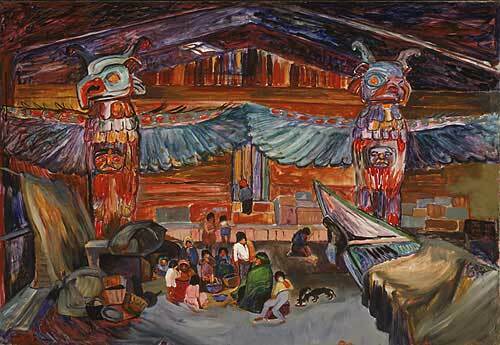 Indian House Interior with Totems (1912-1913) Source: Vancouver Art Gallery/Canadian Virtual Museum. Here at YMCA Exchanges, we’re big fans of travel, especially when it comes to taking those kinds of trips that not only leave you with good memories for years to come, but those that leave you with ideas to improve your life right after you come back. Those kind of trips that make you want to tell everyone else *right now* about what you saw and how they have to see it too (in real life, not just through your Instagram page). Canadians have been taking these kinds of trips for a long, long time, and this month’s hero of history–painter, writer and all-around inspirational person Emily Carr– is no exception. Of all the travels she took in her life (and there were many!) three trips in particular shaped the course of her life and are the reason why she is a Hero of History to us today. 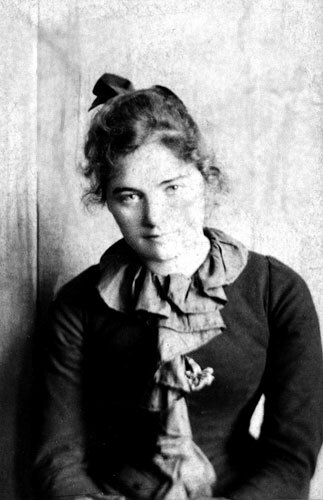 Emily Carr was born on December 13, 1871 to British-born parents in Victoria, British Columbia, the 5th of 6 children. While growing up, she took an interest in the nature around her, which led her to draw many pictures of the trees, animals and beautiful scenery that was never too far from where she lived, despite no one in her family having any aspirations to making art and a lack of artistic role models. Emily’s parents died when she was in her early teens, and she took comfort in her art. Some time later, she convinced her guardians to send her to the California School of Design in San Francisco, and while there, she built on her artistic talents, learning the basics of painting. She returned to British Columbia three years later and began using her newly minted skills, teaching art classes for young children. While living in Victoria, she realized that the art world outside of her hometown was brimming with new styles, influences and potential, far more than the current level of her skills and what her hometown had to offer to improve those skills. She seized an opportunity to travel to France with her sister Alice in 1910, and arrived in Paris to discover the modernist art movement, among the many others that were starting at the time. Emily took classes at the famous (and controversial for its time, as it was the first to accept female students) Academie Colarossi, but ultimately developed her talents with a British artist, Harry Gibb. Despite the budding art movements of cubism, futurism, abstraction, and fauvism, Emily developed her own post-impressionist style of painting, and returned to Victoria in 1912 with a renewed and improved set of skills to use in her creations. In addition to the nature around her, Emily had always taken an interest in the Native peoples of the Pacific Coast, who shared much of the same landscape, but were a world away in terms of their customs, lifestyle, and especially art. 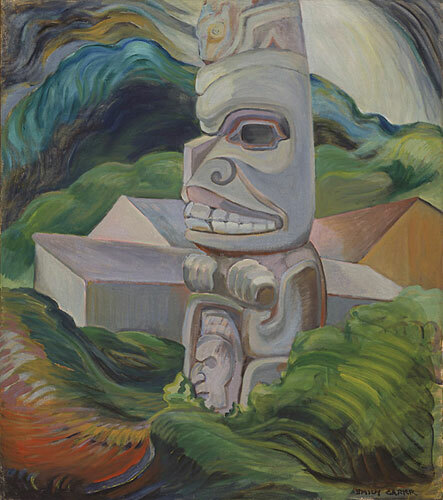 The goal for the next stage of her artistic creations was to document the various totem poles and other artistic parts of the lives of the First Nations of BC. To do this, she traveled to the Queen Charlotte Islands and the Skeena River area for 6 weeks, documenting the art of the Haida, Gitksan, and Tsimsham people. The drawings and carvings she made from this trip would be the basis of many of her most famous works which showcased two important themes: the life and art of the Aboriginal cultures of the past, and the landscape of west coast Canada. A Skidegate Beaver Pole (1941-1942). Source: Vancouver Art Gallery/Canadian Virtual Museum. Though much of her work was unknown to Canada until after her death in 1945, Klee Wyck (“the laughing one”, her name given to her by her Native friends while traveling through the Queen Charlotte Islands) made an impact on many works of Canadian art in the years afterwards, especially those depicting Native culture. She is known as a “Canadian Icon” of Canadian art. From her travels to the United States, France and within Canada, her life is a statement in that travel leads us to open our horizons, to tell our stories and more importantly, to share the stories of others. Categories: Canadian Heritage, Heroes of History | Tags: Academie Colarossi, British Colombia, Canada, Emily Carr, France, Gitksan, Haida, Instagram, Klee Wyck, Pacfic Ocean, Paris, Queen Charlotte Islands, Skeena River, Tsimsham, United States, Victoria | Permalink. What DO Canadians eat, anyway?|Que mangent les Canadiens dites-vous? Fish and Chips from Newfoundland. |Poisson-frites, Terre-Neuve. Who doesn’t love a hot piping bowl of poutine?! Where does maple syrup come from? Tree sap, of course! Chicken Shawarma, a favourite in the nation’s capital of Ottawa. First and foremost, you can’t say “Canada” without thinking of our most famous and original idea: tossing some cheese curds on delicious golden fries and then slathering on some hot, creamy gravy! That’s right—POUTINE—the iconic and delicious staple of any Canadian’s diet. Diving into a well-deserved, heavenly bowl of poutine is truly Canadian. Second on the list is as equally famous as poutine – maple syrup! This liquid gold cannot be beat. The best thing about our amazing tree sap is its versatility! You can drown some fluffy waffles in it, marinate some famous salmon with it or even take a page out of Quebec’s “sugar shack” book and mix it in with some baked beans (and everything else on your plate). My personal favorite: a maple syrup taffy pull, when fresh, hot syrup is poured on cool snow and rolled onto a stick, making for one of the best lollipops ever—and it’s all natural. No matter how you eat it, it’s guaranteed #droolworthy! The third thing Canadians can’t get enough of: international food! Whether it’s chowing down on a shawarma on the go or loading up on Chinese food – you are sure to be quite content. From sushi to Indian food platters to pierogies, our (very spoiled) Canadian taste buds highlight the amazingly rich and diverse culture our country benefits from. Last, but definitely not least, TIM HORTONS! If every Canadian doesn’t at least wake up to a steaming cup of coffee from one of our favourite coffee shops, they’re chowing down on a Timbit or 5 on the go! It’s so ingrained into Canadian society that it’s often the first thing we ask for once getting home from our journeys abroad. I may be a little biased, but I’d say that Canadians have the best food around! What’s your favourite Canadian food? Let us know in the comments! D’abord et avant tout, vous ne pouvez parler du Canada sans penser à notre réputée et originale idée : mettre du fromage en grains sur de délicieuses frites dorées et les recouvrir d’une sauce chaude et crémeuse! Eh oui, la POUTINE! Ce mets principal iconique et délicieux fait partie de l’alimentation tout Canadien. Plonger dans un bol de poutine savoureuse et bien méritée est une réalité tout à fait canadienne. En deuxième place, mais certainement aussi connu que la poutine, se trouve le sirop d’érable! Rien ne peut surpasser cet or liquide. Sa versatilité est ce qui distingue le plus notre excellente sève d’arbre! Vous pouvez y noyer des gaufres épaisses, l’utiliser pour faire mariner du bon saumon, ou même, prendre une page du livre de recettes de la cabane à sucre du Québec et le mélanger avec des fèves au lard (et avec tout ce qu’il y a dans votre assiette). Ma façon préférée de le manger : en tire sur la neige, c’est-à-dire, lorsqu’on vient de verser du sirop frais et chaud sur de la neige froide et qu’on l’enroule autour d’un bâton pour en faire un des meilleurs suçons! 100 % naturel. Peu importe comment vous le mangez, c’est #asenlecherlesbabines, garanti! La troisième chose dont les Canadiens ne peuvent se passer : les mets internationaux! Que ce soit de manger un shawarma sur le pouce ou bien de faire le plein de nourriture chinoise, vous pouvez être certain d’être satisfait. Des sushis au mets indiens en passant par les piérogues, nos (très gâtées) papilles canadiennes mettent en évidence la culture extrêmement riche et diversifiée dont bénéficie notre pays. Le dernier, mais non le moindre, TIM HORTONS! Si tous les Canadiens ne se réveillent pas avec un café chaud de l’un de nos restaurants préférés, ils mangent un – ou cinq!- Timbit sur le pouce. Ce restaurant est tellement ancré dans la société canadienne qu’il est souvent le premier endroit où nous souhaitons aller lorsque nous revenons d’un voyage à l’étranger. Il se peut que je sois un peu biaisé, mais je dirais que les Canadiens ont la meilleure bouffe en ville! Quel est votre mets canadien préféré? Faites-nous le savoir dans les commentaires! Categories: Canadian Heritage | Tags: Canada, food, Instagram, maple syrup, mets canadiens, poutine, Quebec, shawarma, sirop d'erable, sugar shack, Tim Hortons, Timbits | Permalink. YMCA Exchanges’ Twitter, Facebook and Instagram Profiles. |Les profils Facebook, Twitter et Instagram d’Echanges Jeunesse Canada. We have so much to share with you in so many ways about the experience of a lifetime. Did you know that in addition to our Facebook page, you can find us on Twitter and Instagram (@ymcaexchanges) and our blog (ymcaexchanges.com)? 1) Like us on Facebook, and follow us on Twitter and Instagram. 1) Leave a comment on a Facebook post made from April 14-30, 2014. 2) Like or leave a comment on one of our Instagram photos taken from April 14-30, 2014. All names will be entered into a draw, and two (2) winners will be chosen on May 1st, 2014. Winners must be able to receive direct messages on Facebook to receive a prize. Good luck! We look forward to getting to know you while you’re getting to know us! Bon vendredi tout le monde! Afin de vous donner la chance d’apprendre à mieux nous connaître, nous avons décidé d’organiser un concours! Saviez-vous qu’en plus de notre page Facebook, vous pouvez nous suivre sur Twitter et Instagram (@ymcaexchanges), et que nous avons aussi un blogue (ymcaexchanges.com)? Voici comment gagner des prix avec les programmes d’échange du YMCA! Augmentez vos chances de gagner! Les noms de tous les participants seront inscrits dans un tirage au sort, et deux gagnants seront pigés le 1er mai. Les gagnants doivent pouvoir recevoir des messages privés sur Facebook pour remporter leur prix. Bonne chance! Nous avons hâte d’apprendre à vous connaître pendant que vous apprenez à nous connaître! Categories: resources, YMCA Youth Exchanges Canada Program | Tags: contests, Facebook, Instagram, Twitter | Permalink.